If you’ve ever looked at Firebirds, Formulas, and Trans Ams, and thought they all kind of look alike, you’re right, as far as the body lines go. There are differences, though – mainly under the hood. Firebird is the name of the whole lineup of these cars, with Firebird being the basic trim package for the line, and Trans Am and Formula being special trim packages. One easily spotted feature that tells you if a car is a basic Firebird is right under the hood. Pontiac Firebirds are the six cylinder models – with one caveat. What Makes a Firebird a Formula? The Pontiac Firebird Formula has the V8 engine of the Pontiac T/A, but the basic lines a classic Firebird. Leaving off the extra features that deliver the Trans Am ‘look’ while still providing the powerful V8 engine and Trans Am suspension made the Formula Firebird lighter and more responsive and powerful. What Makes a Firebird a Trans Am? With the Pontiac Firebird Trans Am, you get a little extra power, courtesy of the V8 engine. You also get the exceptional handling of an upgraded suspension, plus the Trans Am has some extra body effects and a more luxurious interior so you can enjoy the ride in style. Interested in Buying or Selling a Classic Pontiac Firebird? 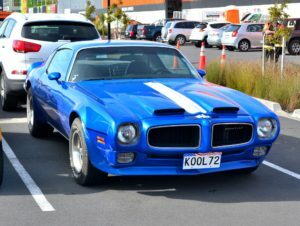 Part of the reason Classic Cars Online US exists is to help connect classic car buyers and sellers, and we’ve added several ways for you to connect, but first, be sure to visit the Classifieds page if you’re in the market to buy or sell classic cars such as the iconic Pontiac Firebird.